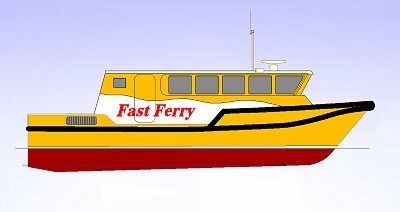 The illustration shows a special design for a HIGH SPEED FERRY for 45 passengers. The craft is based on the surface effect ship (SES) concept. By pumping air between the catamaran hulls most of the weight of the craft is lifted out of the water so reducing the power needed to travel at high speed. Even taking into account the power needed for the air pump, substantial savings on fuel cost (in the region of 40%) can be made. Typical speeds are in the region of 25 to 40 knots. When at rest the craft has all the advantages of a catamaran hull i.e. a broad stable platform that is easy to manoeuvre.